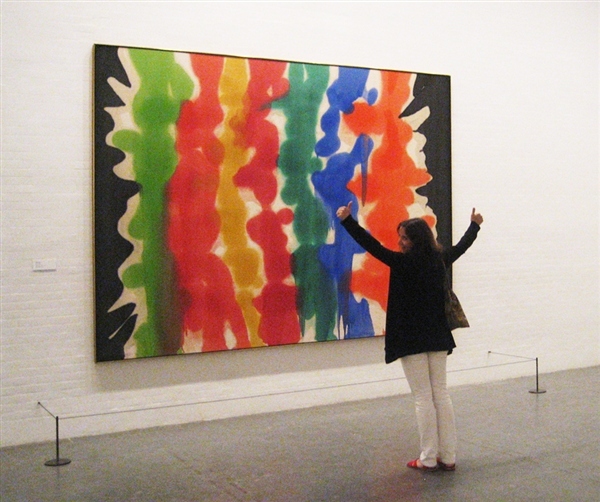 The invite to “Four Paintings” shows a woman, arms raised in victory, standing in front of Morris Louis’s 1959 painting Para I. Other than their considerable size, the four works in Regina Rex’s exhibition appear at first glance to share little with Louis’s “stain paintings,” which converted Pollock’s expressionism into experimentation. By diluting his paint so thin that it would seep of its own accord into his unprimed swaths of canvas, Louis created undeniably flat paintings that reveled in the triumph of Greenbergian Modernism. Like Morris, the show’s artists embrace the freedom brought about by the culmination of Modernism to experiment with the space of picture plane. They do so, however, in a manner updated for contemporary artistic conditions. 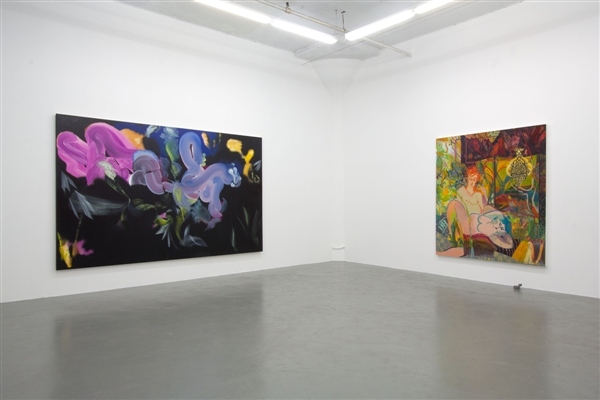 “Four Paintings” at Regina Rex. Installation view. 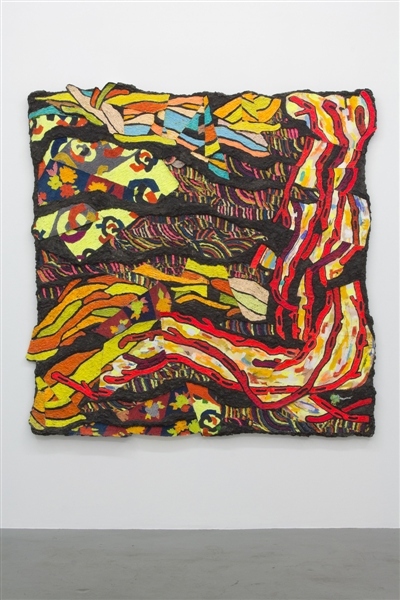 The artists at Regina Rex don’t espouse Louis’s interest in paintings as literal two-dimensional surfaces, or should they—especially not Britta Deardorff, whose Caldera, 2010, made of sawdust, caulking, and encaustic, is decidedly three-dimensional. What they take from Morris, then, is his understanding of the wealth of opportunities that Modernism’s triumph paradoxically opened. His small group of “Para” paintings—little known in his generally more austere oeuvre—represent an unusually energetic and lively group of works that convey the artist’s joy at discovering what paint is capable of. Assured of painting’s definition, the artists in “Four Paintings” embrace the freedom to reintroduce both illusionistic and emotional depth back into the picture plane. Jackie Gendel, tbt, 2012. Oil on canvas. 80 x 70 in. 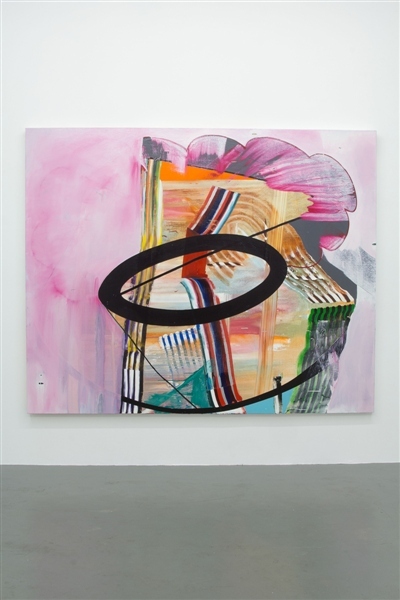 With her thick, textured painting, Deardorff makes the long process of working and reworking that often goes into abstract painting physical in order to make it visible. As in many of Jasper Johns’ iconic works, fast-drying encaustic destroys abstraction’s myth of immediate perfection by revealing the painter’s calculating hand. 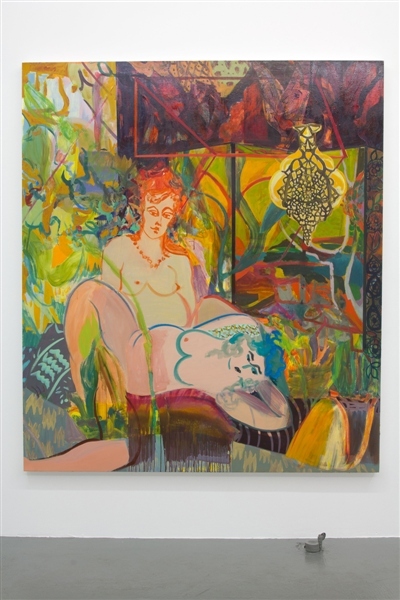 Similarly, Jackie Gendel’s tbt, 2012, is a palimpsest of her experiments with color and pattern. Multiple overlays of inherently flat fabric and voluptuously volumetric female bodies produce a sense of two-and-a-half-dimensionality between the abstract plane and illusionistic space. Although clearly inspired by Matisse, she resists his tendency, particularly in later works, toward opaque, graphic forms that disguise earlier deliberation. Juan Gomez, Canta el Satin, 2012. Oil on canvas. 122 x 84 in. Eric Sall, Eastern Northeastern, 2012. Oil on canvas. 78 x 96 in. Rather than starting from a flat, white slate, Juan Gomez begins with a deep, black abyss that references the indeterminate space of darkness. 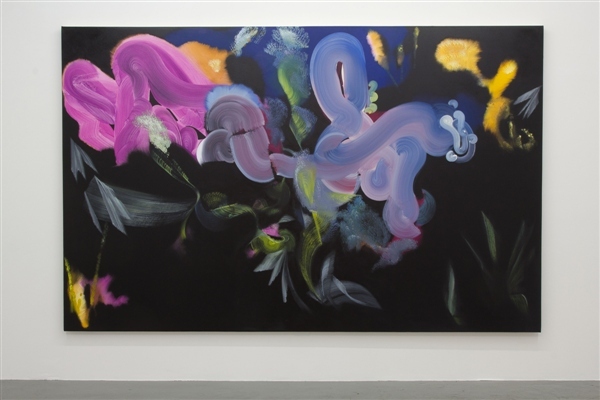 He fills this unknown space of Canta el Satin, 2012, with unknowable swirling forms made from gradated paint strokes that evidence the movement of his brush along the canvas. Although they suggest a deep-sea landscape, the shapes never fully transition into identifiable representation. Eric Sall’s Eastern Northeastern, 2012, involves similar gradients of color in a game of contrast between hard and soft edges. Rippling sets of stripes conceivably modeled on Daniel Buren and reminiscent of market awnings and beach towels weave in and out of an appropriately atmospheric ocean sunset. A stark black oval at the center of the canvas, however, disrupts any illusion of landscape and calls attention to the variety of painting techniques the artist used to form these shapes and spaces. Whereas Louis sought to eliminate individual gesture, these younger artists allow their painterly processes to remain in the final work. The paintings that result do not appear incomplete as much as they appear indeterminate, presenting a space that is neither fully abstract nor fully illusionistic. It is a personal, imagined space that comes into being through the artists’ sustained involvement in the process of painting. In our current culture of instantly conjured and instantly digested images, art often succumbs to the Photoshopped slickness of the visual culture with which it unavoidably completes. Deardorff, Gendel, Gomez, and Sall resist this temptation to succumb, opting to let their edits and interventions remain visible rather than disguised and allowing their doubt and confidence to be seen in equal measure. The resulting works make “4 Paintings” a refreshingly engaging exhibition in a world where images rarely ask us to look beyond the surface. 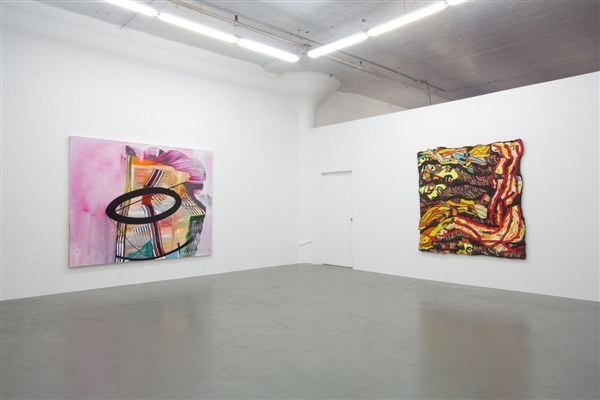 “Four Paintings” is open at Regina Rex through June 3, 2012. All images courtesy the artists and Regina Rex.